You can export scores from the Gradebook and download them to your computer as a CSV file. Exports are sorted first by assignment group as they appear on the Assignments Index page, then by assignment placement within an assignment group. CSV downloads honor multiple grading periods. The Gradebook exports the grading period being viewed in the Gradebook. For All Grading Periods, if the option to view total grades is not enabled, Total Score columns and assignment group totals are not included in the download. Click the Export button , then click the CSV File link . If you navigate away from the page during the export, the CSV file will appear as a previous download in the Gradebook export drop-down menu so it can be downloaded again. The Gradebook will show the date and time you requested the export. If you made changes to the Gradebook after exporting a file and want to export a new file, click the CSV File link again. Edit the scores in Microsoft Excel. Make sure to save the file as a .csv file type. Previous Topic:How do I upload all student submissions for an assignment in the Gradebook? 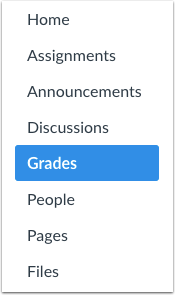 Next Topic:How do I upload changes to the Gradebook? Table of Contents > Grades > How do I export grades from the Gradebook? Re: How can I print an empty grid with student names for writing grades?